xvi+158 pages with diagrams, tables and 4 plates. Royal octavo (9 1/4" x 6 1/2") bound in 3/4 leather with marbled boards. 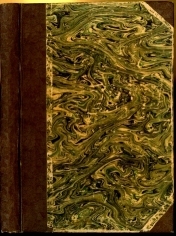 Bibliotheca Van der Linde-Niemeijeriana: 5405) First edition. 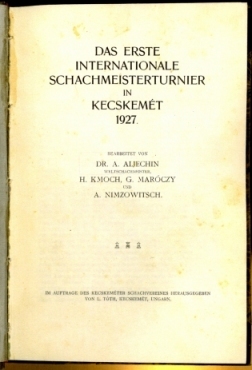 This tournament (June-July 1927) was unique in being the only important post-First World War contest played on the discredited group system. The twenty players were divided into two groups of ten each, the first four in each group qualifying for the A final, the next four for the B final and the last two dropping out. As in St Petersburg 1914 thinks did not work out according to the preconceived notions and two grandmasters, Tartakower and Grunfeld, failed to make the top final. Alekhine dominated group A, conceding draws only to Gilg and Kmoch; in B his feat was duplicated not, as expected, by Nimzowitsch, but by Lajos Steiner, who drew with Ahues and Nimzowitsch and won the rest. The scores from the qualifying groups were carried to the finals. In these finals Alekhine won only one game, drawing six and just scraped home from Nimzowitsch and Steiner, who tied for second. 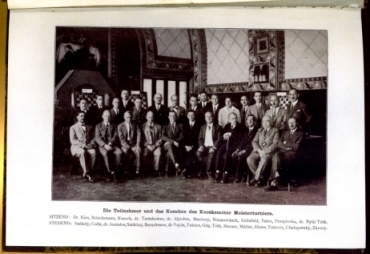 The full results were as follows: Group A: Alexander Alekhine (8); Lajos Asztalos and Hans Kmoch (6); Karl Gilg (5 1/2); Johann Takacs and Savielly Tartakower (4 1/2); Wilhelm Brinckmann (3 1/2); Frederick D Yates (3); Hans MÃ¼ller (2 1/2); Ladislav Sarkozy(2). Group B: Lajos Steiner (9); Aron Nimzowitsch (6 1/2); Karl Ahues, Arpad Vajda and Edgard Colle (5); Ernst Grünfeld (4 1/2); Vladimir Vukoviæ (3 1/2); Karl Berndtsson, Dawid Przepiórka and Jeno Szekely (2 1/2). Top Finals: Alekhine (12); Nimzowitsch and Steiner (11 1/2); Asztalos (9 1/2); Ahues, Kmoch and Vajda (8 1/2); Gilg (8). B Finals: Tartakower (9 1/2); Grungeld (8 1/2); Takacs and Yates (8); Berndtsson (7); Brinckmann, Colle and Vukovic (6). Extremities rubbed, title foxed else a very good copy.